Whether you're getting married indoors or out, there are so many different ways you can dress up your aisle. Here, see some of our favorite ideas. Swirls of petals create a lovely romantic atmosphere. Coat the edge of your aisle runner in bright petals, and place coordinating pomander balls on the chairs. Float down a cloud-like aisle covered in white petals. 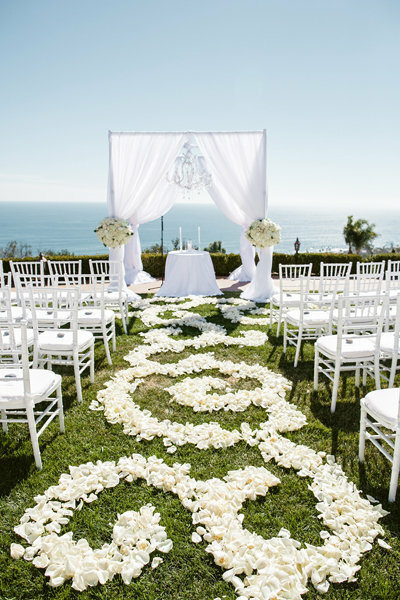 Arrange your petals like a scalloped banner along your chairs. Cover your aisle with ombré petals that get more vibrant as you approach the front. Add extra dimension to a petal-covered aisle by using two clearly-divided colors. Arrange your petals in hearts for a laid-back approach. Sleek lines and a monochromatic color palette create the perfect aisle for a modern wedding. For an outdoor ceremony, choose colors that'll really pop against the green grass. Reflect the season — scatter leaves instead of petals during a fall wedding. Bring the indoors out with this idea. Mark the beginning of your aisle with an oversized floral arrangement. This arch brings a touch of the great outdoors into this church wedding. Luxe floral designs transform your ceremony spot into an enchanted garden. This "roof" makes an outdoor wedding feel more intimate. A ceiling of orchids makes a dreamy covering for your aisle. Antique lanterns provide a wonderful contrast against modern ghost chairs. Place candles on tree trunks for a rustic-chic ceremony. Create an ultra-romantic glow with dozens and dozens of candles. Place your candles inside tall hurricane vases for an extra security measure. Fill a large space by placing your floral arrangements on tall pedestals. Elevate your arrangements with ivy-covered pedestals for a romantic vibe. Low arrangements won't block your guests' view during the ceremony. Line your aisle with fresh greenery for a luxe rustic appeal. Reflect the fall foliage outdoors with these gorgeous trees. Transform your setting into a winter wonderland with snow-covered branches. Soaring dogwood branches bring a touch of the outdoors in. Let the landscaping take care of the decorations for you. Oversized paper flowers transform your wedding venue into an enchanted garden. Pinwheels are a fun and colorful choice for an outdoor wedding. Pay homage to your past by lining your aisle with pictures of the two of you through the years. A no-muss, no-fuss idea: ribbons blowing in the wind. Skip the flowers in favor of budget-friendly fabric balls. Personalize your aisle runner with your love story. Use petals to make a pretty design on your aisle runner. Tip: Glue them down so that they still look picture-perfect after your entrance. Let your runner take center stage by choosing a bold color. Transform a plain white aisle runner with creative lighting. This scroll runner features the couples' vows. Mark off your ceremony aisle until showtime with a cute sign. Let your favorite Bible verse welcome guests to your ceremony.